Annemarie and her family. 2010. I am a dessert-first girl. I LOVE my sweets so today we’re talking cupcakes—actually, one special cupcake. For the better part of the last 10 years I had been on a quest, a cupcake quest. You see, my two boys have food allergies. My 7-year-old, Benjie, is allergic to peanuts. 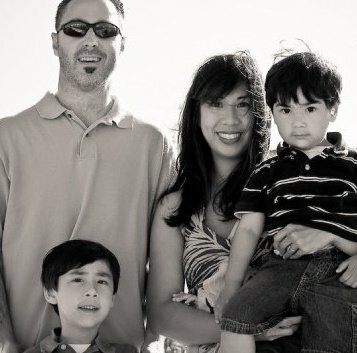 Josh, who’s 10, has multiple food allergies. His toughest allergies are to dairy (milk, cheese, butter, etc. ), eggs, and all nuts. Pretty much everything I bake is dairy-free, egg-free, and nut-free. From the beginning, birthday parties were challenging. Josh can (almost) never eat the birthday cake, so it was up to me to find a replacement. I started experimenting on cake recipes when he was 1. In the beginning he seemed okay with the bland vanilla cupcakes I made, but I wanted more. I wanted him to jump up and down when he heard, “It’s cake time!” I wanted his cake to be as yummy as the one that held the candles. I went back to my kitchen and tried again, and again. When I’d find a cake recipe that showed promise, I would make my allergy-friendly substitutions—rice milk for milk, vegan Egg Replacer for eggs, Spectrum Shortening or Earth Balance for butter. The cakes were all “just okay” and Josh could take them or leave them. I gave up for a while. Then I discovered that I could make Rice Krispie Treats with Spectrum Shortening or Earth Balance and Josh loved them! These became our go-to, all-occasion party treats. They were tasty and easy to make. I brought them to school to celebrate the boys’ birthdays and everyone was happy. The treats easily transformed into hearts, pumpkins, dreidels, or Christmas trees. They were fantastic…until they weren’t. After a blissful Kellogg’s year Josh had burned out on his dairy-free Rice Krispie Treats and I was back in the kitchen experimenting. Next was the year of the “Perfect Sugar Cookie”. You know those sugar cookies, the ones in the shape of flawless flowers and beautiful butterflies. They have that smooth, satiny, multi-colored icing. I found an amazing sugar cookie recipe that Josh and I both loved. It was delicious even with my dairy and egg substitutions. Then, I went to Michael’s and brought home all the equipment to decorate the cookies just so. I watched dozens of You Tube videos to get the icing techniques down. And it worked! Those cookies wowed the crowd and I didn’t even have to qualify them with, “They’re dairy-free and egg-free. That’s why they taste like that.” There was just one problem. They took hours, sometimes days to make and decorate. It was just too much, especially when we had parties every other week. Eventually, I reassigned the Perfect Sugar Cookie to very–special occasion treat only. It was back to the kitchen for me. I was determined to find something just as good, but simpler. And I did! A few months ago, I came across a quirky little recipe that was supposedly created during the great depression. It requires no eggs, no milk, and no butter because those items were rationed at the time. I tried the cake recipe and it wasn’t bad. On top of that it was ridiculously easy. I tweaked it here and there, adding more chocolate and more sugar. It was pretty darn good but it didn’t become THE CUPCAKE until I added chocolate chips. Wow! 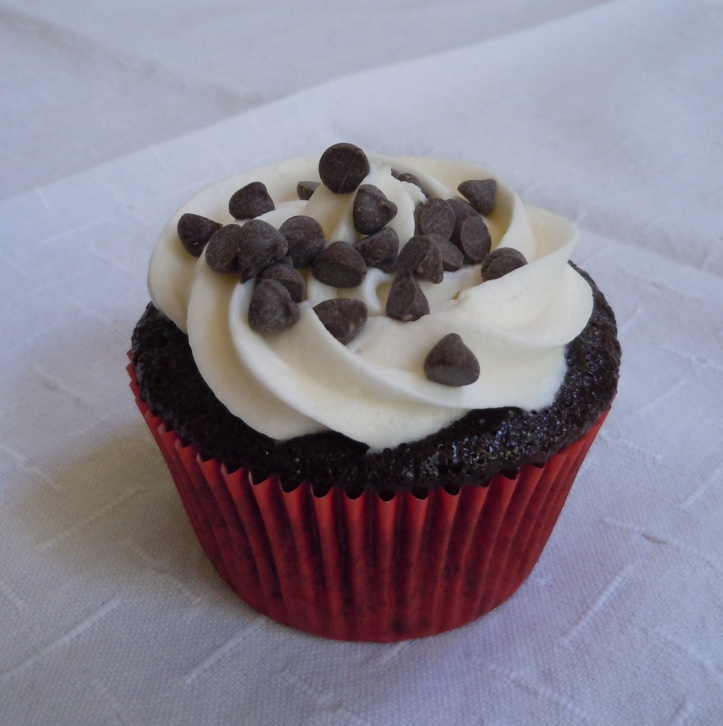 The chocolate chips made this cupcake a winner! It’s super-chocolaty, almost brownie-like. I pair it with a homemade vanilla frosting but it’s delicious even without the frosting. It’s a big hit, with everyone except Josh that is. He doesn’t like chocolate! I know, what? I’m experimenting on a lemon cupcake for him now. I’ll let you know how it works out. I, for one, love this cupcake. Here’s the recipe. Enjoy! Fill the muffin liners about ⅔ full. Bake about 20 minutes, or until a toothpick inserted into the center of the cupcake comes out clean. In the bowl of a stand mixer fitted with the paddle attachment, cream the shortening and margarine on medium speed for about 1 minute. Add the confectioners’ sugar, milk, and vanilla. Beat until smooth and fluffy, about 5 minutes. Pipe onto cool cupcakes and finish with extra chocolate chips. **I use Spectrum Organic Vegetable Shortening and Earth Balance Vegan Buttery Sticks for the shortening and margarine respectively. If you like, you can use all shortening or all margarine. Before I go, I want to give a shout-out to Wendy and Riggins for inviting me here today. Wendy is my dear, dear friend. We share a love of wine & cheese–as a meal, much-too-much TV, and all things arts and craftsy. I am honored to be blogging in her space today. Let me know how they turn out! I bet they are super yummy.